Crete is geografically situated on the far edge of Greece, but the big island is in front when it comes to music. The musicians in the very front don’t come from the big cities Heraklion or Chania, but from Anógia. First the sound of the ocean and the wind. A slow cello is moving forward. And soon the deep voice of a woman. Some intuitively produced knock-knock-sounds. We are being lifted up from the ocean and moved towards a difficult terrain up in the high mountains. The music doesn’t exist on record, but in the last few months it has been out on YouTube. 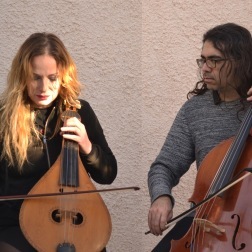 The name of the tune is "Thalassaki", the name of the female singer is Niki Xylouri, the cello is being played by Isodoros Papadakis. Both are from Crete. Not many in the world are listening to contemporary Greek music. 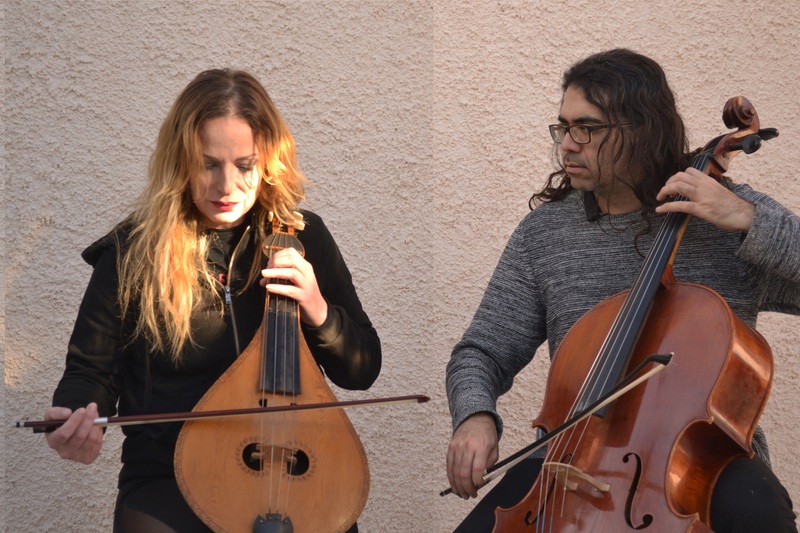 There is a language barrier, and the music seems to live it’s own life inside the borders of the country – apart from the large groups of emigrated Greeks, especially in Australia. 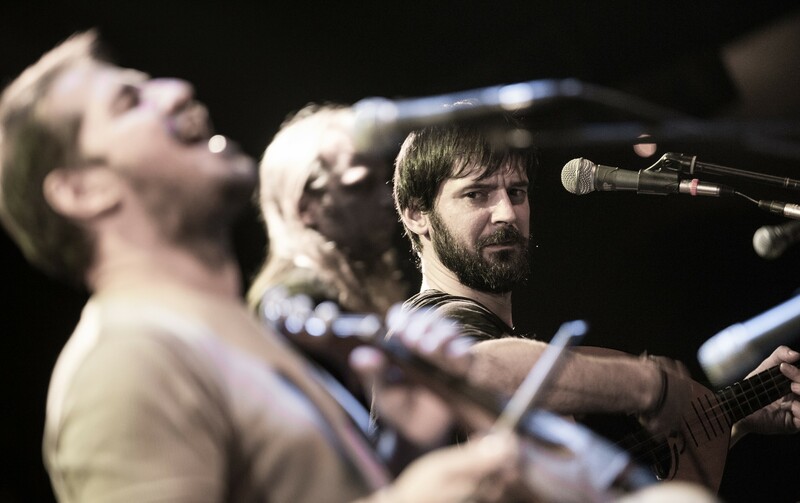 During the recent years Cretan music has evolved more vitally and quickly than Greek music in general. But there is not one clear direction or style in this movement. Niki Xylouri is moving in an experimental direction. There is avantgarde, a small portion of jazz and quite a lot of Cretan folk music in her creations. The brothers Nikos and Giorgos Stratakis are moving in another direction. They do it mostly in an oldfashioned way – that means traditional songs sung with their own voices and played on instruments made of wood, skin and metal. They have a power, an energy and a diversity that in combination create extreme dynamics. Check out their concerts – it is happening on YouTube, unless you are lucky enough to run into them in Heraklion, Chania or Athens. They do a lot of performances. A third direction, only loosely connected to the Cretan music environment, is represented by Giorgos Xylouris. He is married to an Australian woman and has through 20 years been living partly in Melbourne. 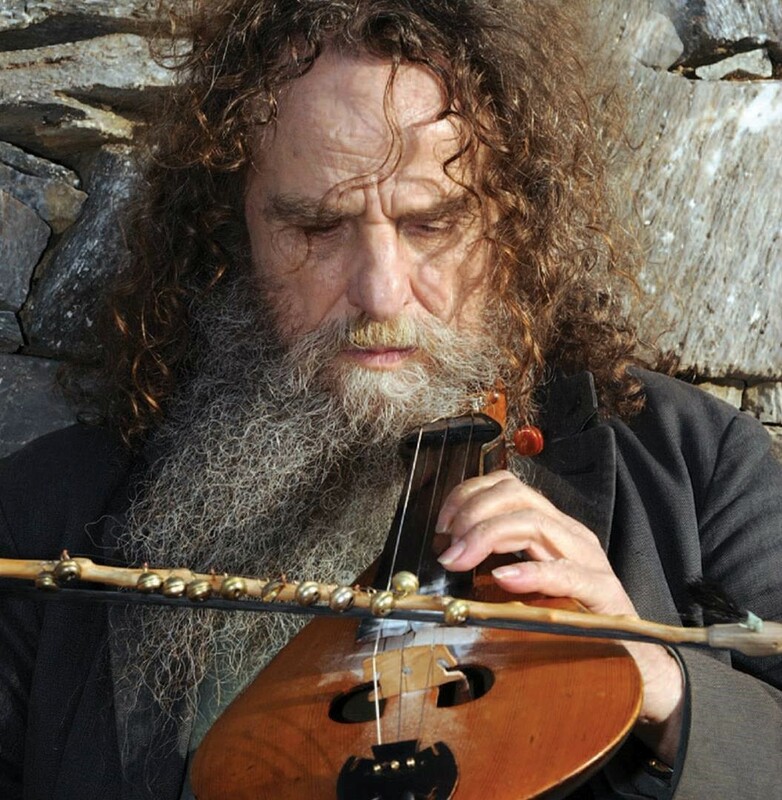 He is the singing and melodic half part of Xylouris White. The other half part is the drummer Jim White, who before this has been playing in different Australian punk bands. In the beginning – five years ago – they played an akward and edgy fusion, mostly instrumental, but today Giorgos Xylouris sings on a lot of the tunes. Though not exactly with a beautiful voice in the true sence of the word. Telling about Cretan music would be incomplete without telling a little about the Xylouris family. The big star and pioneer of Crete has for many years been Psarantonis, today 75 years old. Inspirer and patriarch. A deep voice and a fierce performance. There is a wildness and a spontaneity in his singing and playing the lyre. His way to success has not been easy. His real name is Antonis Xylouris and he is the younger brother of Nikos, who in the 1970’s was a big shot all over Greece and was involved in many projects until he died of cancer in 1980, 43 years old. 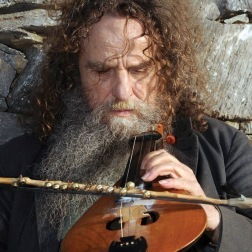 Nikos Xylouris was extrovert and colourful, and his music was a mixture of folklore and pop music. In comparison Psarantonis is strange and dark and goes his own ways. He has only slowly moved out of the shadow of his brother. Three of the children of Psarantonis are musicians. 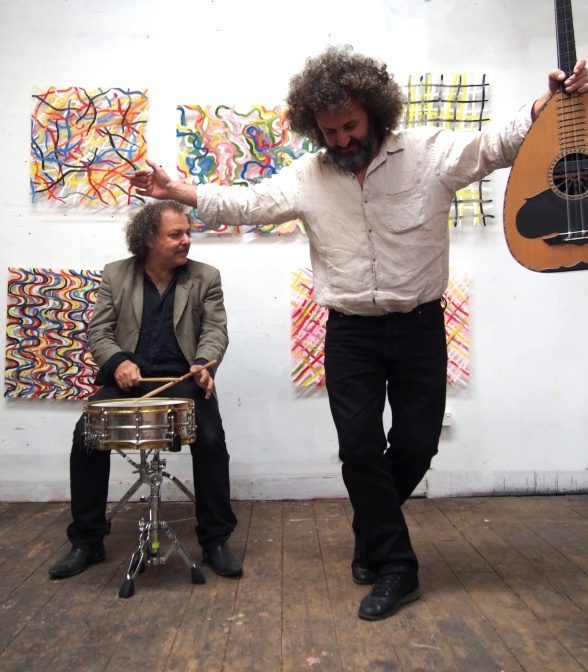 Giorgos Xylouris primarily plays the lute, Lambis Xylouris plays lute, lyre, oud and more, Niki Xylouri is playing percussion. All three of them – today 52, 48 and 39 years old – are singing. Especially the sons had to fight to get out of the shadow of their father (yes, one more shadow). They have suffered a similar dilemma as the daughters of the Danish female singer Annisette: How develop when you are always compared to a person born with a unique original power and energy? 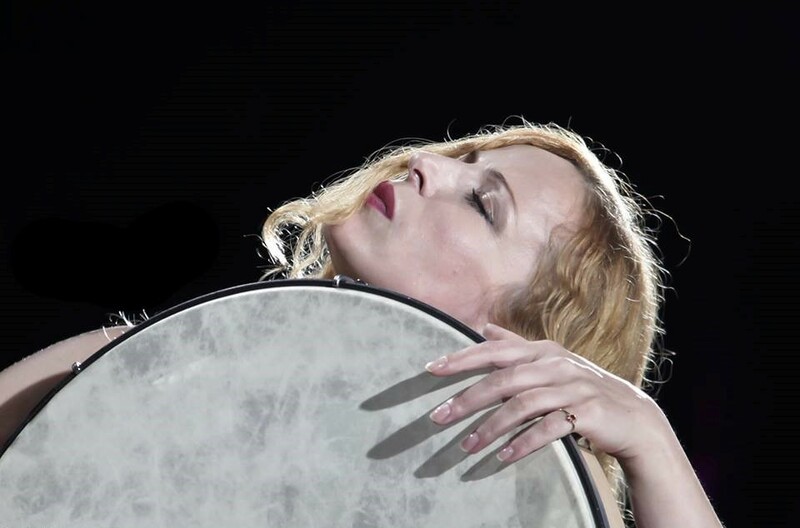 As a woman and a percussionist Niki Xylouri seems to have had an easier career than her brothers. She has played mostly and for the longest time in her father's different ensembles. Probably she will turn 40 before she will release music under her own name. That means she can put experience, harmony and authencity in her musical expression of sadness and sometimes pain. At this point the Xylouri-Papadakis experiment has the title Loop Project. The voice of Niki and the instruments are mixed with noise and effects with the aid of two loopers, letting the sounds run in loops, layer for layer, explains Isodoros Papadakis. The Xylouris family comes from the small town of Anógia, situated around 800 meters above sea level, in the middle of the island and on the way to the mountainaous massif of Psiloritis where the highest peak is 2456 meters above the ocean. A proud town with tradition for resistance. Turks, Germans and the junta tyrants from Athens had difficult times here. It is not a coincidence that Nikos Xylouris’ interpretation of the old Cretan hymn "Pote tha kai Xasteria" became important in the fight against the military junta. Many other excellent musicians also origin from Anógia. Nikos and Giorgos Stratakis come from Rogdia situated between Heraklion and Anógia. In some way or another the musicians find a way down from their mountains. Most of them at some point in their life find themselves living in the capital city of the island, Heraklion, and there they perform, record their music and make their astonishing pretty videos. They know each other from back home. They have a common understanding. 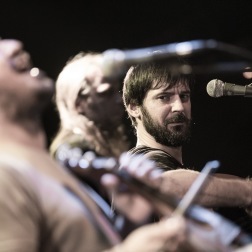 This understanding comes to reality in a recording of the song "Mantarini", one of Nikos Stratakis’ most spectacular tunes, a highlight when he and his brother Giorgos performs. They have not recorded it on an album themselves. But Nikos is involved in a three year old version. Here he, the youngster, not yet 40 years old, is sitting humbly playing his lute, while the old mad man Psarantonis sings, and strange voices and effects are running in loops. Pure magic. Neither that song is released on record. But to find on YouTube. (with Niki Xilouri, Psarantonis and others). Vi er vokset op med denne musik, vi er menneskelige, vi er ikke et multinationalt selskab!